Marvel’s Agents of S.H.I.E.L.D. introduced fans of the Marvel cinematic universe to a whole new group of characters when it debuted last fall. 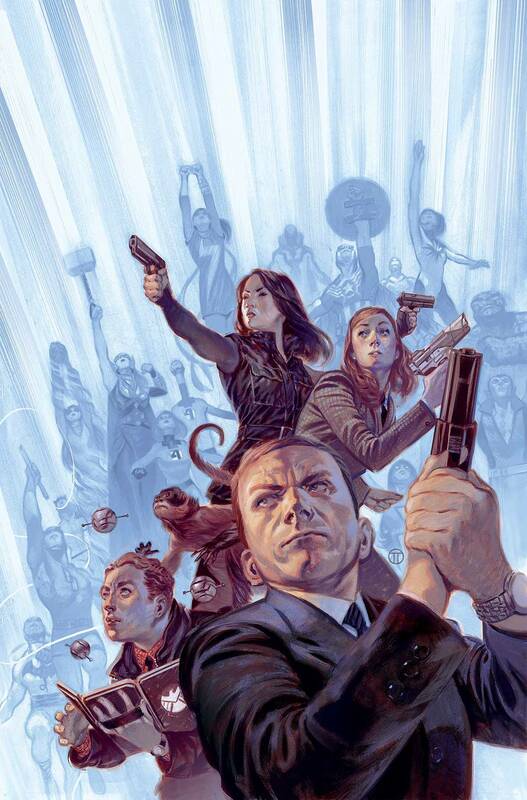 Agents Melinda May, FitzSimmons, Skye, and Grant Ward, all led by Agent Phil Coulson, the heroic agent who sacrificed himself in the battle against Loki in The Avengers. Nearly halfway through Agents of S.H.I.E.L.D.’s second season, only Coulson has been properly introduced into the Marvel Comics universe. That will all change on New Year’s Eve, when Marvel Comics releases S.H.I.E.L.D. #1, the first issue of a new series from Eisner-winning writer Mark Waid. The new series will see Agent Coulson tasked with assembling teams to combat various crisis across the globe. These teams will be comprised of both superheroes and S.H.I.E.L.D. agents, including the cast of characters from Agents of S.H.I.E.L.D. When Agents of S.H.I.E.L.D. debuted, the people who work on that show talked a lot about the challenge of introducing brand new characters who lack superpowers into a world already populated by fantastic beings. How do you handle facing that same challenge by bringing those characters to the Marvel Comics universe, which is even more crowded with superhumans, and trying to make them connect with fans? That’s a great question, and I took my cue from Coulson’s scenes in THE AVENGERS. Coulson IS a fan, at least of Captain America’s. He read everything about Cap, he collected trading cards, he no doubt has Cap comics. My inference from this is that he studied the Golden Age heroes when he was a kid the same way his pals studied ball clubs--and when the Fantastic Four heralded the new Marvel Age, Coulson was just the right age (late teens) to invest in them, as well--not in a fan way, more in a “let’s see if these guys can measure up” way. He’s a filer, he’s a cataloguer, he’s a data nut--and he’s since been studying all Marvel’s heroes and villains with the same degree of precision that real-world online indexers do. Now that he’s an adult, now that he’s an Agent of SHIELD, it’s not because he’s a “fan”--it’s because the salvation of the world on any given day, in the face of any given menace, could depend on Coulson putting together the exact necessary “dream team” of heroes to act as field agents. He needs to know everyone’s powers, capabilities, weaknesses, etc.--and he studies them. Just like us! Coulson is probably the most popular and well-liked character in the series, right out of the gate? Have you found any of the other characters really standing out, maybe in ways you didn’t expect? Simmons is fun because I was given a little leeway with her to establish (at least in the Marvel Universe) her relationship with her parents. It’s not at all what you’d expect. They’re SO disappointed in her. You’ll see why. The solicitations for this series make it sounds highly episodic, and you have well-earned reputation for being an excellent single-issue storyteller. Does the format make this book a natural fit for you? Are there hidden challenges there that an outsider might not realize? Will there be an overarching story involved, or is this series all about the standalone missions? There is an overarching menace that builds subtly across the first six or so issues to a payout--so pay attention to the clues!--but the standalone nature of the individual missions is a fun challenge. My job is to get in, get the job done, get out--kind of like SHIELD’s overall M.O. It’s not unusual for a Marvel Comic to have multiple artists these days, but this series in particular is billed as featuring a rotating art team. How does this affect your approach to the series? Do you embrace it and allow the tone and style of the book to change somewhat drastically from artist to artist, or are you the one trying to reign things in and keep it consistent? The rotating art team is one of the draws (no pun intended) to me! To be able to work with some of the best and most legendary storytellers in all comics? I’m blessed to be able to collaborate with talents who don’t have the time or opportunity to do long arcs, and I’m able to rekindle relationships with past collaborators like Carlos Pacheco and Humberto Ramos--that’s a gift. And, yes, I purposely tailor the stories to the artist’s strengths and to what he or she might want to draw. Humberto, for example, specifically asked to draw high school kids because he finds them so fun and expressive--hope he likes Ms. Marvel! You’ve mentioned in previous interviews that these will be the Marvel Comics “versions” of these characters. What are some of the key differences that we’ll see between these versions of these characters and their television counterparts? If I do my job right, you WON’T “see” the key differences. For instance, in the Marvel Universe, by necessity of it being part of a 50+ tapestry of continuity, SHIELD isn’t the ragtag skeleton crew that it is on the show--but rather than make a big deal about that, in the comics we just try not to play up helicarriers and unlimited resources. There are things about the TV characters we can’t really address in the comics, but not because of any orders from on high--it’s just a matter of timing. For instance, we can’t do much with the Fitz/Simmons soap opera that’s been on the second season thus far because that’ll be long resolved by the time our comics come out. The key, I think, is to make sure everyone sounds like they do on TV--the object is to keep their voices, personalities and relationships intact. Can you tell me a little bit about S.H.I.E.L.D.’s opening stories? We’ve seen from the original teaser image that established Marvel superheroes will likely be making regular appearances, and from the solicitations that one of the first is Ms. Marvel. Were you looking forward to working with Kamala Khan? Are there any other hero guest stars that you can tease that you’ve had a particularly good time working on for the series? Kamala Khan was a GREAT character to work with, one of the best additions to the Marvel Universe in forever. And I’m still trying to crack that Howard the Duck/Rocket Raccoon team-up, maybe today’s the day. But, honestly, the one character who’s been the most surprising fun to write so far? The Invisible Woman--who, we find out, has a secret life as a part-time SHIELD agent that even her family knows nothing about. S.H.I.E.L.D. #1 hits stands New Year’s Eve, December 31.